In the excerpt below, from the book Empowered: Unleash Your Employees, Energize Your Customers, and Transform Your Business by Josh Bernoff and Ted Schadler, the authors discuss how a company can bring its business to the mobile web. The technological and strategic choices facing you as you deploy a mobile application are complex. You may be highly empowered and resourceful, but you still need a plan. We recommend that you follow the POST method, named for the four steps you follow in building your plan: people, objectives, strategy, technology. If you read Groundswell, you know we use the POST method for companies that are pursuing social technologies; the same basic technique applies in designing a mobile strategy. As with social applications, the key for mobile applications is to examine the people and objectives first, before designing a strategy and choosing a technology. Before you get started, evaluate the mobile behaviors of your target audience. Our survey research shows that E*TRADE’s customers are nearly twice as likely to be connecting with the mobile Internet as average customers. This is the type of research E*TRADE used to decide that a BlackBerry application would be popular with its day traders and mass affluent customers. 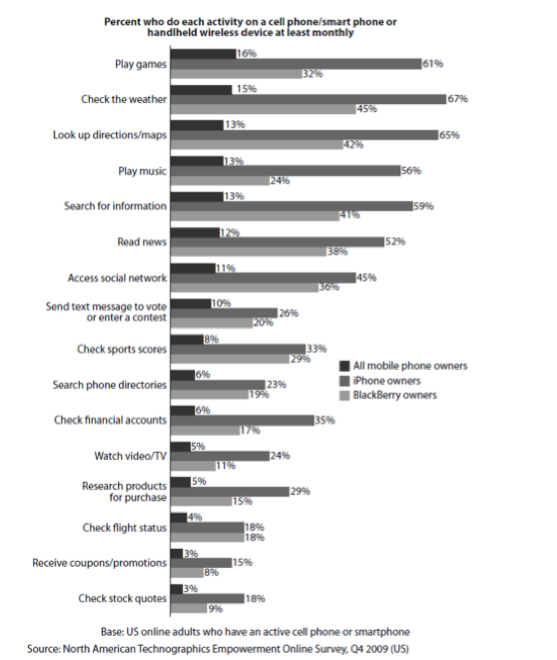 As you can see from figure 5-1, owners of different types of mobile devices behave differently. And you need to plan not only for what devices and behaviors your customers have now, but for how their activities will change in the future. As a rule of thumb, younger customers are more comfortable with devices like the iPhone and mobile behaviors like texting and downloading content. And of course, in the United States and Europe, BlackBerry devices appeal more to professionals. One quick way to assess your customers’ profile is to look at the mobile browser traffic to your Web site. When Sears noticed increasing mobile traffic to its site, it designed a mobile Web site that delivered information to these customers better. Another retailer redesigned its mobile site after noting that 80 percent of the mobile traffic came from iPhones. If you’ve already got a mobile Web site, pay close attention to the devices that access it—this mix will tell you if it makes sense to create a mobile application for Apple, BlackBerry, or Google Android phones. You can find out more with customer surveys or through information in syndicated surveys like Forrester’s Technographics. Regardless of what method you use, though, don’t design a mobile strategy until you’ve gathered intelligence about your customers’ mobile behaviors. Once you know your customers’ mobile habits, you need to figure out why you’re bothering to connect with them. Mobile applications can help with marketing, sales, and service; to be successful, you must narrow down which objective you’re pursuing. There are three basic categories of mobile objective (and always remember, mobile offerings work only if your customers get as much out of them as you do). Mobile applications that increase sales succeed in multiple ways. For example, Pizza Hut’s iPhone application generated more than $1 million in sales the first three months it was live. Targeting a young audience, Pizza Hut built a pizza delivery racing game into the app. Because the Pizza Hut app made it easy to add toppings, iPhone orders totaled significantly more per order than orders coming in by telephone calls. You can also increase sales by increasing the information in interactions. Benjamin Moore’s director of color technology, Carl Minchew, worked on the development of an iPhone app called ben Color Capture so customers could take photos and then find paint colors to match or complement colors in the photos. Inspiration like that can lead consumers from ideas to transactions. Benjamin Moore’s application also includes a store locator, a popular feature that helps drive sales. Target goes a step further on this front; its mobile application actually helps identify whether local stores have products in stock. Mobile applications save money by connecting people directly with answers, removing service people from the process. This is a perfect example of a win-win, since the customer gets quicker service while the company saves costs and increases the quality of the interaction. Mobile connections are part of the groundswell customer service we described in the previous chapter. For example, Nationwide Insurance built an iPhone app that walks its policyholders through the process of preparing to file a claim right at the scene of an auto accident.6 The application includes prompts to take all the necessary steps, including calling the police, recording the location with GPS, taking photos, locating a repair shop, and even turning all the pixels white so the phone can be used as a flashlight. Customers get faster service and don’t miss steps since they don’t have to call an agent. Nationwide gets claims with more complete information, saving their claims agents time. [inline-pro-content align=”left”]iPhone apps are not the only way to connect with customers. American Airlines delivers information on flights, delays, and cancellations with SMS, email, and a mobile site, the perfect way to reassure nervous travelers. Even if you can’t increase sales or decrease costs, mobile applications that supply information can generate love— or at least satisfaction. For example, Bank of America’s online site and apps are designed to improve its customer experience. The apps are designed to answer questions like “Where is the closest ATM?” and “What’s my balance?” The experience uses a login and authentication taken directly from the bank’s online banking service, further reinforcing the idea that the company provides convenient service. Notice that these applications are not replacing calls—most of the inquiries conducted on mobile devices would never come into the bank as phone calls—but instead reinforcing the idea that the bank is a service leader. After 1 million iPhone downloads of the Bank of America app—the most of any financial application for the iPhone—the bank began publicizing its mobile phone services with TV commercials. strategy: what’s the long-term plan for your mobile application? Where will the information that fuels your application come from? What systems does your application need to touch and coordinate with (for example, billing, customer service, or your own Web group)? How will you publicize your application so customers know about it? Consider traditional advertising, customer emails, mobile services like AdMob, and signage. Once your application is built, will you concentrate on reaching more people by supporting more platforms, or on extending the functionality for the applications you have already built? How will you gather data from mobile users and use it to benefit your business? Who is responsible for that data? Is this a short-term promotion or a long-term commitment? If it’s long-term, who will maintain the application? What’s your model? Is the application actually a product you can charge for, or will you be delivering benefits to the rest of your business? How will you measure those benefits? technology: what types of mobile application are you building? Text messaging. Messaging strategies have the enormous benefit that nearly every phone supports them, and over half of U.S. mobile phone users use text messages.Text messages, also known as SMS (short message service), are suited to the timely delivery of perishable information, like eBay auctions; query responses, like stock quotes; and voting and sweepstakes entries. Mobile sites. At this writing, one in nine mobile phone customers say they access the Web monthly on their phones; we expect this to grow to 39 percent by 2014. Reconfiguring your site to recognize and deliver content for mobile phones makes sense, but it’s far more than just shoving content around. You’ll need to identify which bits of information are most valuable to mobile users and design layouts, menus, and graphics to deliver them quickly. The emerging Web standard HTML5 will make mobile sites easier to create. Apps. Since the iPhone came out, apps are all the rage. While apps can get access to phone features like location, the camera, messaging, and links to other Web sites, they can cost around $100,000 to develop. Since they take a moment for customers to download and take up space on the phone’s display, you’ll need to spend money to promote them to generate awareness and make sure they have value. Another challenge is the variety of incompatible app platforms from Apple, Google, RIM, and others. 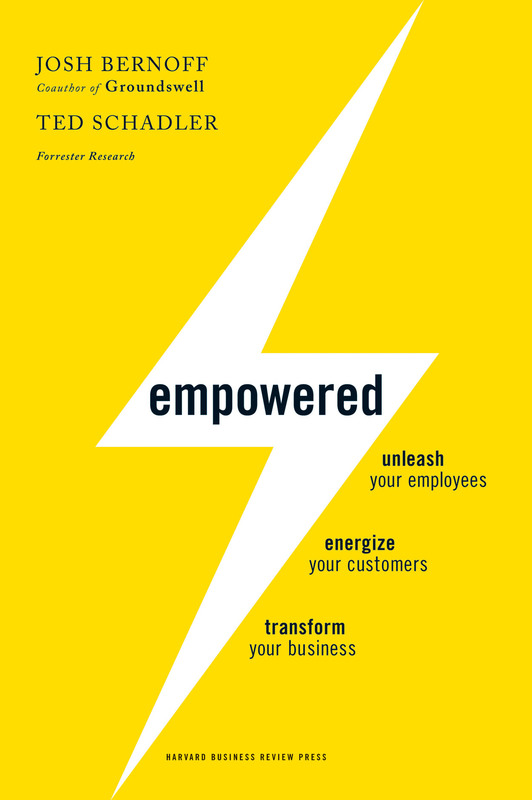 Adapted from Empowered: Unleash Your Employees, Energize Your Customers, and Transform Your Business by Josh Bernoff and Ted Schadler (Harvard Business Review Press). Copyright 2010, Forrester Research, Inc.
Will Metered Mobile Data Slow the App Market’s Growth? Thanks for posting this excerpt of Empowered! The truth of the matter is the creation of a trusted relationship between your company and your customers is the best way to generate ROI when implementing a new mobile marketing strategy. People are much more willing to participate in SMS based campaigns when you provide them with the tailored information they are looking for, whether it be mobile coupons or specific product information. At Globaltel Media we’ve seen particular interest from our retail customers in the ability to provide specific product details and mobile couponing to their customers remotely. By providing customers with on the spot information about products, retailers are able to build a bond and level of trust with customers, increasing the chances of purchase and brand loyalty. This is especially true for local businesses that need to compete for market share with the larger chain stores. Thanks for the article! Agreed. I understand JKOnTheRun.com is part of a network of sites. However, I feel like I am having to filter more and more content from this blog because it’s either cross-posted from the network or is a “sponsor post”. Would appreciate a feed that is just core content from James and Kevin. Not to be confused with the POST (Power On Self Test) method that my computer and myself use every morning during wake up process. I personally yank and crank everything to make sure all my bits and bobs are working properly before heading out the door if you knows what i means. After exiting the fortress (my home) i use the KICKASS method during the daily commute to work and yes, I take NO PRISONERS!. James, any chance of getting Om to make an RSS for you and Kevin that doesn’t include all this soybean based editorial filler material?